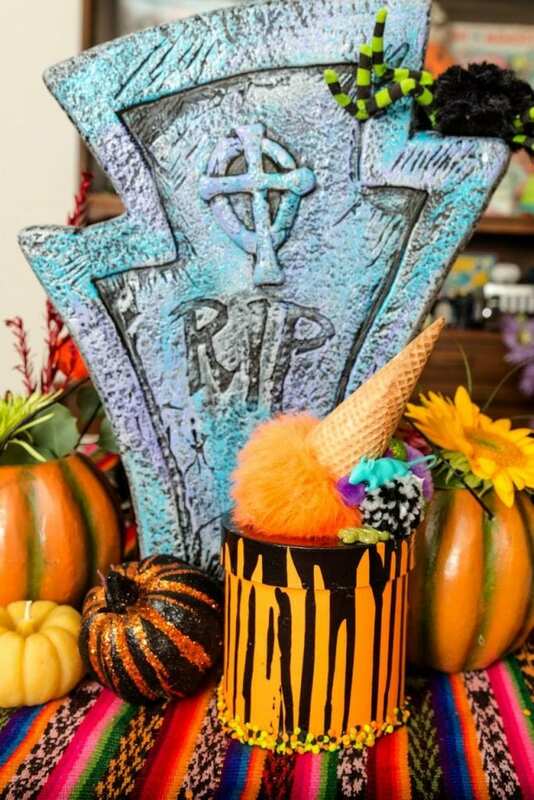 This fun little Halloween drip box inspired by a dripping ice cream cone cake looks cute enough to eat. Even though that is a real ice cream cone and real candy sprinkles, I wouldn’t recommend it. This is the kind of box that you put a few tricks and treats inside. 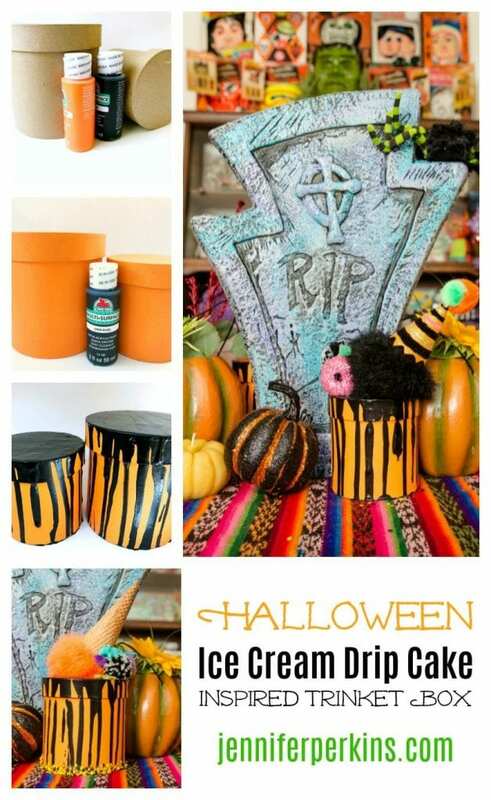 Perfect as a decoration, Boo gift for your neighbors or perhaps elaborate goodie bag option for a small Halloween party. The best part is these guys are easier to make than it is to bake a real cake. 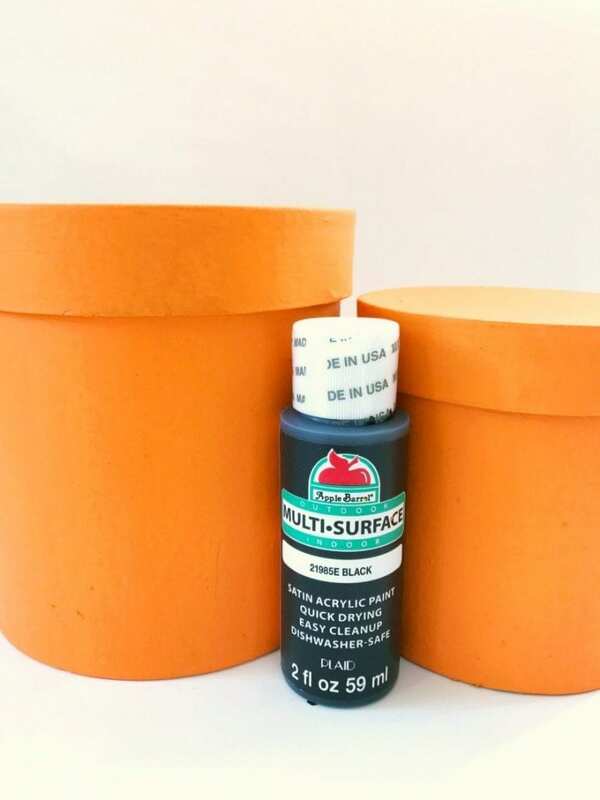 Start by painting the boxes one solid color. Think of this as the base layer of icing for your cake. You may need more than once coat of paint. Water down slightly the color that you want to use for the drips. Spread across the top of the box and allow to spill down the sides. The more random the better. Allow paint to dry completely. When the paint is dry it’s time to decorate your cake. The edible versions of these cakes look like an ice cream cone is dripping down a cake. In place of ice cream use a pompom. 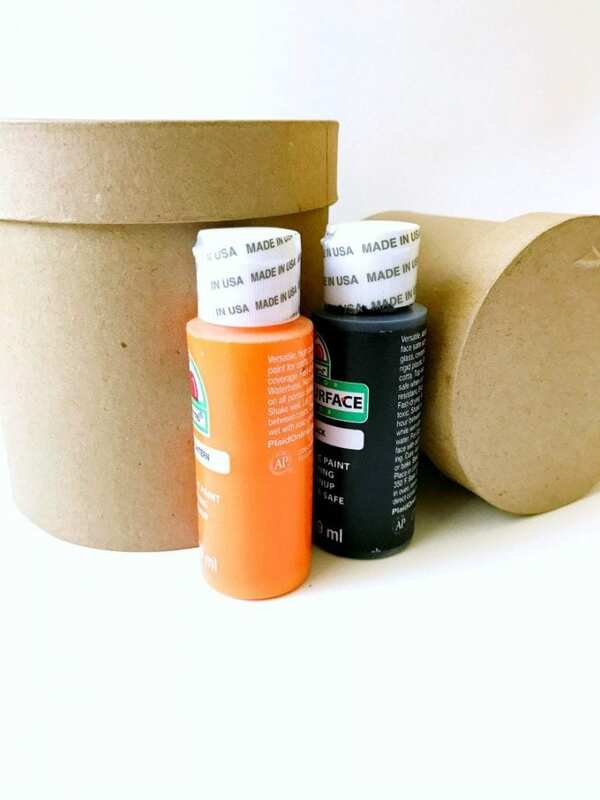 Attach with glue to the top of the box. Add a ice cream cone tilted to once side. 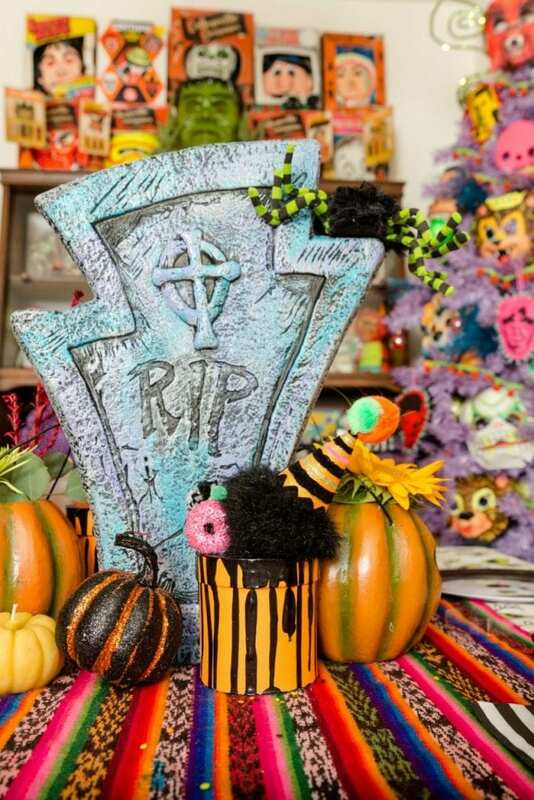 From here small toys, faux candies and even sprinkles can be added as decorations. These boxes (and cakes) are supposed to look over the top, so the more the better. 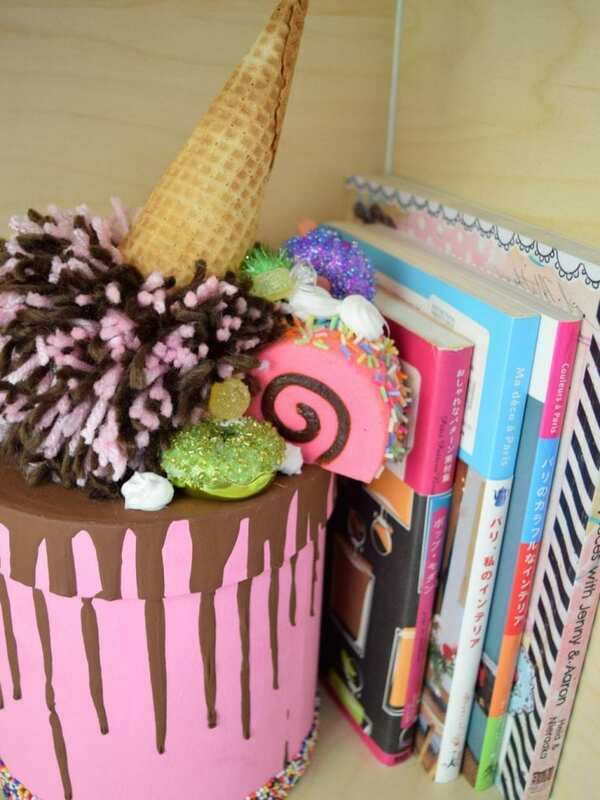 You are going to want to make more than one of these Ice Cream Drip Cake Inspired Trinket Boxes because you will want to give one and keep one for yourself! Have you ever made an ice cream cone cake? Real or fake? I feel like I need to bake one now to match these boxes. 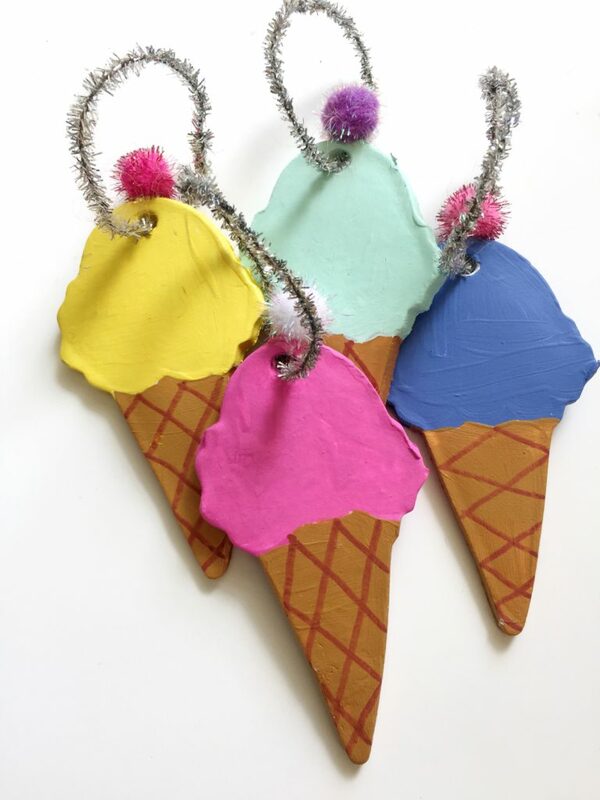 Air Dry Clay Ice Cream Cone Ornaments – Air dry clay is such a fun medium to work with. You can make almost anything, including ice cream cone ornaments! DIY Ice Cream Cone Cake Ornaments – The mini summer version of the trinket boxes are perfect little ornaments for an ice cream themed Christmas tree. 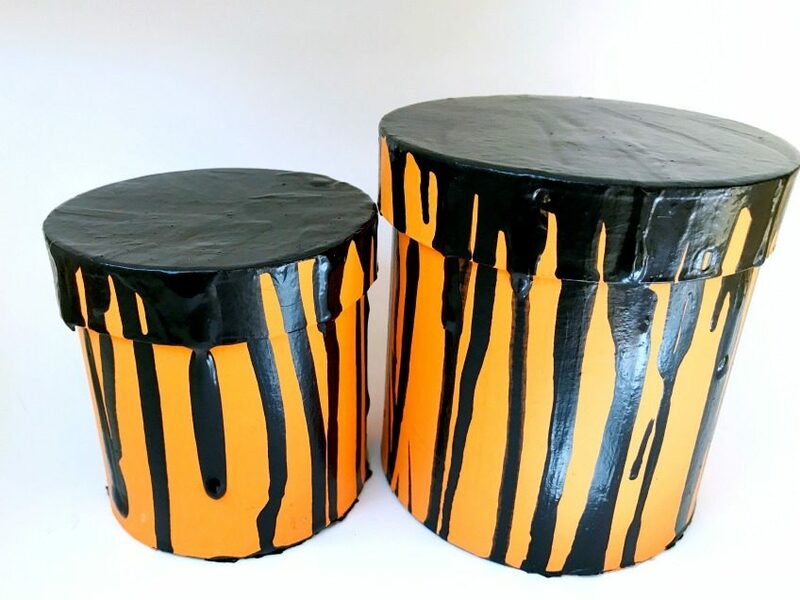 How to Make a Spilled Ice Cream Cake Trinket Box – Over on DIY Network I share another variation on the ice cream trinket box. This one without the Halloween theme. Posted October 25, 2017 & filed under Halloween, Holidays.